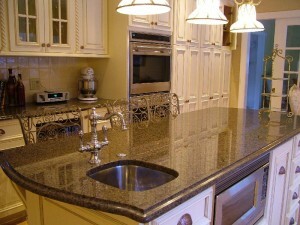 Throughout our company’s history we have loved installing our beautiful granite countertops in Central Texas homes. As you can see in our Colors page, we have a wide array of color and grain selections for you to make when you work with us on your next granite countertop. We can get any kind of granite you need. Whether you are looking for something to perfectly match your kitchen, bathroom or any other room we can get exactly what you need for your home. We always get the highest quality granite. Our sources always provide granite that can meet your needs. Synergy Granite can install granite that is non-porous, stain resistant, and material that holds its luster and sheen for years.